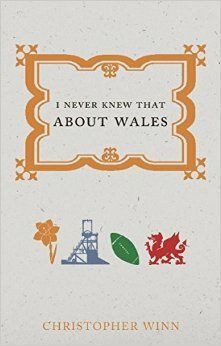 Christopher Winn’s new book will have you continuously saying ‘I Never Knew That About Wales’! Packed full of legends, firsts, birthplaces, inventions and adventures, I Never Knew That About Wales visits the thirteen traditional Welsh counties and unearths the hidden gems that they each hold. A glittering pantheon of writers and artists, thinkers and inventors, heroes and villains have lived and toiled in this small country. This book seeks out their heritage, their monuments, their memories and their secrets. About the author: Christopher Winn’s first book was the bestselling I Never Knew That About England. Volumes on Ireland, Scotland, Wales and London followed. These books formed the basis of the successful ITV1 series, I Never Knew That About Britain. The show aired in March 2014 and regularly attracted viewing figures of over 3 million. A freelance writer and collector of trivia for over 20 years, Christopher Winn has worked with Terry Wogan and Jonathan Ross and sets quiz questions for television as well as for the Daily Mail and the Daily Telegraph. He is married to artist Mai Osawa, who illustrates all the books in the series.